It is defined as the joining of two or more teeth with a rigid unit by means of fixed or removable restorations. It is defined as an appliance used for immobilization of injured or diseased parts. It should allow direct application in the mouth without delay due to laboratory procedures. It should not traumatize the tooth during application. 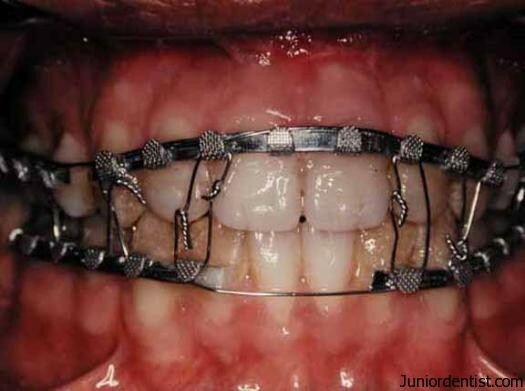 It should immobilize the injured tooth in a normal position. It should provide adequate fixation throughout the entire period of immobilization. It should neither damage the gingiva nor predispose to caries. It should not interfere with occlusion. It should not interfere with endodontic treatment. It should fulfill aesthetic demands. For redirection of forces : Forces of occlusion are redirected in a more axial direction over all the teeth included in the splint . For redistribution of forces: Redistribution ensures that forces do not exceed adaptive capacity . To preserve arch integrity: Splinting restores proximal contacts reducing food impaction & consequent breakdown . Restoration of functional stability: Restores a functional occlusion , stabilizes the mobile teeth & increases masticatory comfort . Psychologic well being: Gives the patient comfort from mobile teeth thereby giving him the sense of well being . It is used in the treatment of dento-alveolar & mandibular fractures . It stabilizes moderate to advanced tooth mobility that cannot be reduced by other means . It stabilizes teeth after acute dental trauma .Ex: Subluxation . Insufficient number of firm or sufficiently firm teeth to stabilize mobile teeth . Prior occlusal adjustment cannot be done on teeth with occlusal trauma or occlusal interference . Patients who don’t maintain good oral hygiene.